Hey there my crafty friends! I hope your day is going GREAT! We are getting gobs of rain up here in Weaverville! We woke up to no power....so school was cancelled and my kiddos are home with me and we have been playing TRANSFORMER MONOPOLY all morning! FUN TIMES....GOOD MEMORIES! The colors I chose are Basic Gray, Real Red, Smoky Slate and Whisper White. I stamped the Basic Gray piece with Versa Mark using the Hardwood background stamp. I then used the Chalk Talk framelits to make a frame in the same piece of card stock. I used the Merry Everything stamp set to stamp on a piece of Whisper White cardstock that fit under the frame, after stamping it I adhered it to a piece of Real Red cardstock. I then wrapped a piece of the Real Red Satin Woven ribbon around the left side of the card, tied on an All Is Calm embellishment with Linen Thread, added a few snowflakes from the Frosted Sequins and some Basic Rhinestones to finish it off and then I attached it over the Merry Chirstmas, with dimensionals, onto the Real Red Cardstock. I think I will add the sentiment from the Ornamental Pine stamp set to the inside of the card...it says "May the peace and beauty of the season remain with you throughout the coming year". That's all I have for ya today...the power is back on...so I better get something done today! The kids want COOKIES! Thanks for stopping by today and following my blog! If you are one of my Redding gals...I SURE DID MISS YOU TODAY! 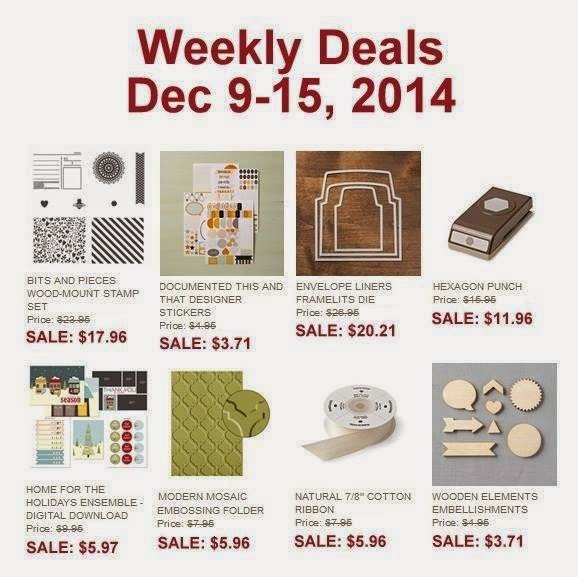 Here are this weeks "WEEKLY DEALS"! There are some GREAT ones! I especially love the Envelope Liner framelits and the Wooden Elements! And here is a groovy new Photopolymer stamp set that I LOVE, called Snuggles and Smooches! HAVE A WONDERFUL EVENING! STAY DRY AND SAFE!! !